Soup, roast turkey, stuffing, gravy, brussels sprouts and mashed potatoes. It all sounds like the typical American holiday meal, but I can't resist adding an Italian accent to the dishes I'll be making. ),and the turkey is roasted with herbs, garlic and white wine. My turkey stuffing is one my grandmother taught my mother to make. It's made with sausage, mushrooms, bell peppers, and onions mixed with rice. The brussels sprouts will be roasted with garlic and pancetta while the potatoes are mashed with butter and Parmigiano Reggiano. And I know Charles has a fine bottle of Amarone lined up to go with the meal. Even the cranberry sauce will have an Italian accent this year. I'm a big fan of mostarda, which takes various forms around Italy. Sometimes it is made with whole fruits poached in a sweet mustard syrup, while other versions are more like a chunky condiment. 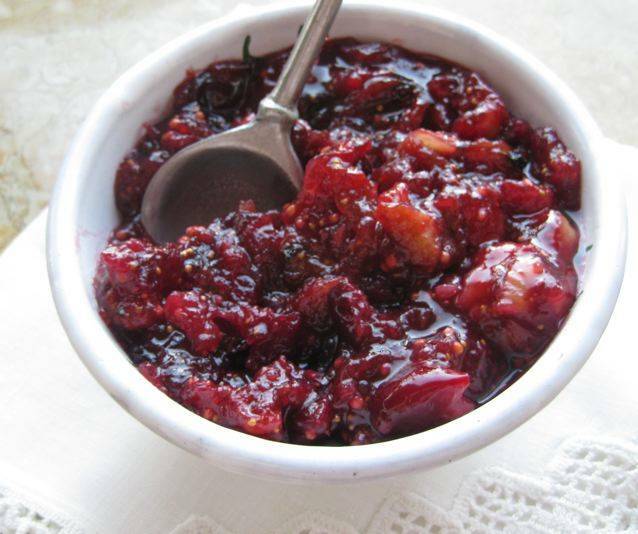 I combined tart cranberries, figs and two kinds of mustard to make a Cranberry Fig Mostarda. Both tangy and sweet, it has a pleasant crunch from the fig and mustard seeds, and its a great companion to the holiday bird. It's also good with a sharp cheese such as a mountain gorgonzola. Wishing you all a very delicious and Happy Thanksgiving! Combine cranberries, figs, sugar, and orange juice in a saucepan. Bring to simmer. Cover and cook 10 minutes or until the cranberries pop, stirring occasionally. Add the mustard seeds and mustard paste. Stir in well. Cook 5 minutes more. Let cool. Scrape into an airtight container. Cover and refrigerate 24 hours before serving. This keeps well for at least 2 weeks.